Collagen Complex is a unique formulation that may help to support the renewal and maintenance of collagen, a fibrous protein component of connective tissue that makes up almost one third of the total body protein. 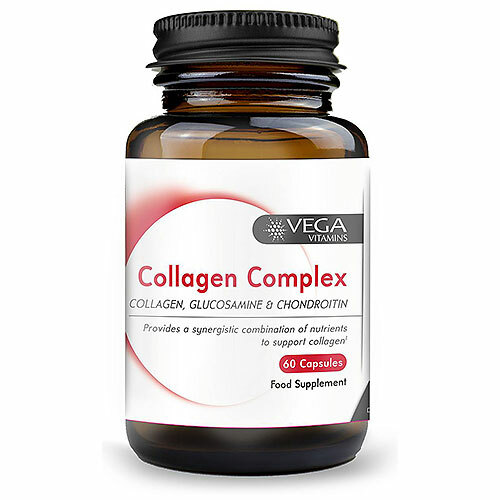 Collagen Complex is fortified with a synergistic combination of glucosamine, chondroitin, vitamin C and the antioxidant enzyme activators copper, manganese and selenium for maximum benefit and effectiveness. Glucosamine Sulphate 2KCI (Crustaceans), Vitamin C (Calcium Ascorbate), Poultry Chondroitin Sulphate, Vegetable Capsule Shell (Hydroxypropyl Methylcellulose, Colours (Titanium Dioxide, Copper Chlorophyllin)), Manganese Citrate, Hydrolysed Chicken Collagen, Sodium Selenite, Copper Citrate, Anti-caking Agent (Magnesium Stearate). As a food supplement for adults, take one capsule daily with food or as directed by a healthcare professional. Do not exceed the recommended intake. Below are reviews of Vega Vitamins Collagen Complex - 60 Capsules by bodykind customers. If you have tried this product we'd love to hear what you think so please leave a review.